It’s a pumped up version of Source Code meets Groundhog Day meets Starship Troopers. As an action movie, this film works. As an alien movie, it could have been better. The cool thing about this film is the premise which uses Groundhog Day repetition on the battle field to solve a sort of mystery. If only the aliens were more creature-like, and less computerized, this movie could have been tremendous. The story works for most of the way through, but it does get a little tiresome by it’s end. Still between the action, the humor, and the interesting plot, this movie ends up being an enjoyable ride. 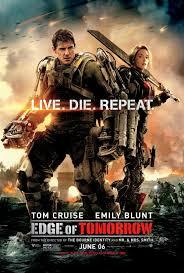 Edge of Tomorrow is basically Groundhog Day set on the battle field. The format here is that a man keeps waking up over and over again on the same afternoon, to relive the same day. Like Groundhog Day, it’s about finding a way to live this day right. Finding a solution. Only here, the story structure is used for action, and the question isn’t how do I stop this day from repeating, but how do I find a way to beat the aliens. Officer Cage (Tom Cruise) actually wants the new day to keep bringing him back to life. You see, every day he dies. If he doesn’t die, and goes to sleep, then this repetition business will end. And he needs to use the ability to keep trying things out until he finds a solution to the alien problem. All of this sounds pretty cool, right? It is. The premise is absolutely great. So is the way the whole plot begins. We are thrown right into the middle of a story with news reports kick-starting the film by telling us about the alien invasions. We don’t get to see the aliens for a while, and that’s a good thing, keeping us in suspense. Instead, we see news interviews with two men. One of them is Cage, a public relations representative for the military. The other is General Brigham (Brendan Gleeson,) who is the big boss in charge of the entire military resistance. We join these two men in real time, away from the cameras, as they take a meeting together in Brigham’s office. The meeting goes horribly wrong on all fronts. Brigham wants to throw Cage into combat in order to prove to the media and the public that it’s not that bad. Cage does not want to go. When it becomes clear that he doesn’t have a choice, he resorts to threatening The General. Bad idea. This leads to Cage getting arrested and then stripped of his identity. When Cage wakes up, he is on the training grounds of an army base, surrounded by soldiers running drills. He is approached by a Sergent (Bill Paxton) who has been told that Cage is a deserter who tried impersonating an officer. The Sergent has also been told that Cage will do anything to get out of combat. At this point, Cage is brought over to the men who will be in his unit, and the next thing you know, he’s suiting up and boarding a plane heading for the battlefield. Now the robotic armor Cage is given is incredible. It includes giant guns that are connected to his suit and hover above his head, firing away like machine gun cannons. The only problem is, Cage has never been taught how to work it. He is dropped into combat pretty fast, without even learning how to take the safety off his weapons. When Cage is killed, it’s because one of these aliens explodes on him and it gets all over his face and in his mouth. This causes Cage to now wake up over and over again each day, on that training ground, at the exact same moment as before. Our first encounter with the aliens is both exciting and frustrating. The way the creatures move is cool, but the look of the aliens leaves much to be desired. Especially in close-up. This is a clear example of a situation where the aliens would have looked much better had they been created with animatronics or makeup or some kind of real life material. It’s the way hollywood movies have always done it. Think of James Cameron’s Aliens. Think of the work of legendary creature master Stan Winston. Edge of Tomorrow uses all CGI and the alien creatures have no personality. In fact, they have very few defining characteristics at all. They are like the squids from The Matrix movies, crossed with Michael Bay’s Transformers. While the alien creatures are definitely a letdown, the story is pretty great. This movie is very smart to not only take us on the battlefield, but also to have the characters escape that location. There is only so much we can handle and enjoy in the exact same place. Knowing that, the movie has Cage find different ways to sneak off and explore. This is how he meets up with Rita, (Emily Blunt,) a famous war hero. It turns out the battle where Rita became known as a legend, was at a time when she also had Cage’s reliving ability. She had it and then she lost it. So she understands what the ability is all about, but also knows that it doesn’t last forever. Rita has some points of guidance for Cage. She knows that there is a host which they are looking for, and that towards the end of this repetition cycle, when it is starting to wear off, Cage will begin to see flashes. The flashes reveal where the host is hiding. Rita and one of her friends, who lost his job over making such claims, inform Cage of all of this. Once he figures out that he’s going to need her, Cage goes and seeks Rita out each day. And each time, the situation is just a little bit different. 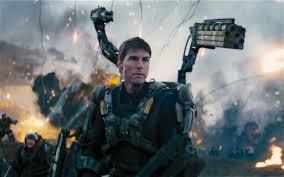 Edge of Tomorrow is creative and exciting, and it is nearly great. The action is fun, but at times it could be better. For example, while I love the giant suits the soldiers wear and ways that guns fly out to make these guys look like they are Doctor Octopus on steroids, the choreography of the actual stunts isn’t anything special. This is a movie by director Doug Liman, the guy who made the best Bourne movie, the Bourne Identity (even if they movie did have a ton of behind the scenes set problems with Liman.) Still, with Edge of Tomorrow, if Liman focussed on the action choreography, I have no doubt that he could have made it more memorable. Aside from that, the aliens are just not as cool as they could have been, had more attention been given to their design. I understand why they used CG effects, since they are so much easier to manipulate, but I would have liked some kind of combination between those and actual prosthetics. Finally the story, which is ultimately a quest, does get a little tiring by the end. The climax is okay, but it’s not quite as exciting as it should have been. Still for all the things this movie has going for it, including plot creativity, humor, and cool weaponry, the small things that don’t work as well are easy to ignore. There’s a lot to like here, as we finally get a smart and unique action movie.